With the GMI and GMI2 at zero, the T2108 is at 13%. In prior extreme declines T2108 has bottomed at <1% (1987) and around 1%. 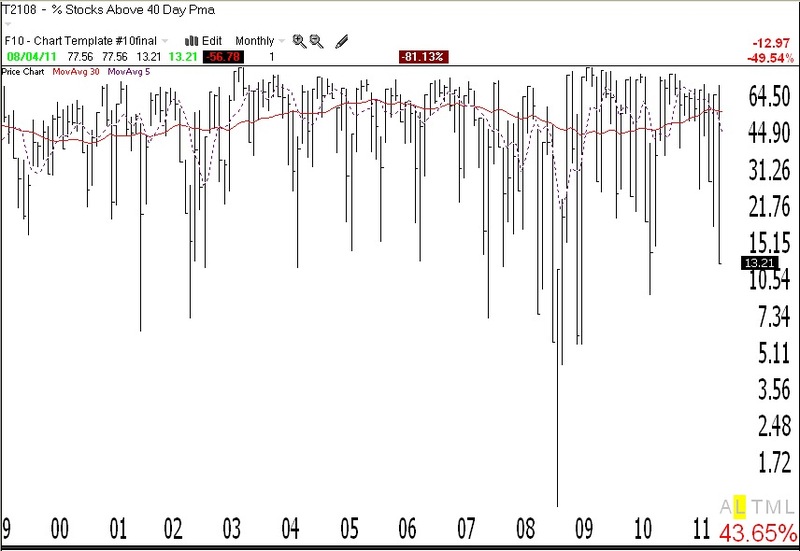 (08) But as this monthly chart shows, declines more often bottom anywhere below 20%. My biggest concern is that investor sentiment polls are not very bearish and pundits are still looking to buy bargains. I remain in cash in my trading accounts. I would be very interested in hearing whether my posts have helped you weather this decline. I have been following your blog for most of 2011. Your posts have been extremely helpful. However, I have been whipsawed a number of times and have found myself trying to “predict” what your gmi #s will do before it actually happens! I stayed in cash and missed the last run up from June through July, but I also missed this down turn. I am patiently waiting for signal now to jump in. Dr. Wish, I have found your concept of tracking various elements of the market to arrive at a numerical value to gain insight into inherant strength or weakness in the market most helpfull. I have used your system,the older 10 point system, with a few subtle changes for over a year now. I track the values daily in Excel, and plot, and analyze the values for insight into the market. In general, it helps me choose appropriate stategies and timeframes for trading/investing. Since coming across your site, I have developed some of my own ‘GMI’ concepts as well. I like ripper was in cash for the big run up but was also positioned in cash for yesterdays melt down. Love the blog and would like some more detail in stocks you are short/long. I follow rigurously your post and I avoided this downturn in my 401K and my personal investments. So THANK YOU. All Cash and keeping profits. Yes, I follow your blog every morning, I have found it to be very useful. I was in cash during this current decline. Your blog is very helpful. t2108 for oversold/overbought and your GMIs for trend. Also your interpretations. Dr. Wish, thanks to your class and this blog, I was able to retain my 401k profits and avoid the recent downturn by moving my savings into stable value low-yield funds. Thank you! I have only been following your blog for a month. I find it very helpful and appreciate what you are doing. Seems if we are sellers when T is above 80 and buyers when below 20 that over time this would be a prudent approach to have returns that exceed industry averages. Thanks again! favorite teacher. And kudos to Judy. Indeed. I went pretty much all cash a couple of weeks ago, although three days ago I did buy some DBP (precious metals fund). I’ll leave it to the “bargain hunters” and “average-downers” to buy in this current market. I read your blogs, but did not do what you said… I am fully invested in AH (accretiva), which I paid $28.50 per share. Following your blog during several years, y can say its the most usefull of all the www for investors!